"Map + cost" track view option. "Map only" track view option. Ability to show trip counters and totals when speed is equal to zero or there is no GPS signal. App shows different speed than my car's speedometer shows. Why? Blank map. Avoid using internet/data. Compass and altitude panel (PRO). Details and troubleshooting for alerting on speed cameras. Export files timestampting. Saving directly to iCloud, Dropbox and others. Flash with speed digits background for overspeed. Fuel and driving range monitor. Give me more speed digit colors! HUD and regular modes. Grid shows instead of an offline map, help! How to pin a track to a map to retrace it later? How to reset/set an individual counter? I'm at a sea level and app shows 80ft (around 25 meters) or more. Why? Idle timer and alert mode. No speed is shown and GPS indicator is red. Help! Off road navigation along the route. SCDB POIs - How to? Speedometer. Importing tracks, waypoints and routes. Speedometer. Units of measurement - Speed. Speedometer. Vertical Speed Indicator panel. Spotify integration - Information page for Spotify's team review. That's not all about the new features! There is no sound alert on exceeding the preset limit. Help! 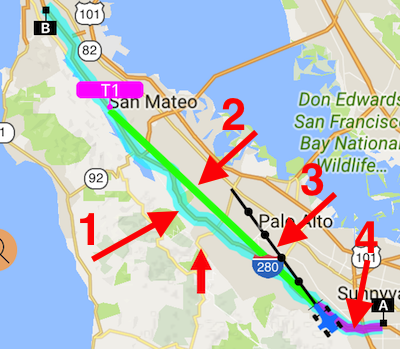 Tracks colored by speed or altitude. US & Canada fixed safety cameras collection. Monthly subscription. Version 1.7 - What's new? What's new in beta version? What's next? What's this HUD - heads up and why it is reversed? Why full version asks for "Always" access to location? Compass 55 v1.9. What's new? Compass 55. Apple map settings. Compass 55. Beta version 1.9. Compass 55. Map list screen. Compass 55. Measurement annotations setup. Compass 55. Options for showing bearing to a target. Compass 55. Point collection screen. Compass 55. Units of measurement - General. Compass 55. Usability QA/Feedback 3-Mar-2019 with Cam T.
Compass 55. Version 1.1. What's new? Compass 55. Version 1.2. What's new? Compass 55. Version 1.3. What's new? Compass 55. Version 1.4. What's new? Compass 55. Version 1.5. What's new? Compass 55. Version 1.6. What's new? Compass 55. Version 1.7. What's new? Compass 55. Version 1.8.2, what's new? Compass 55. Version 1.8.3, what's new? Compass 55. Version 1.8.4. What's new? Compass 55. Version 1.8.5, what's new? Compass 55. Version 1.9.1 - What's new? Compass 55. Version 1.9.4. What's new? Compass 55. Version 1.9.5, what's new? Compass 55. Vertical Speed Indicator panel. Compass 55. Waypoints GPX import and export. Compass 55. What's new in version 1.8.1? Compass 55. What's new in version 1.8? Looks like GPS is OFF. Let's fix it! Version 1.9.2 - What's new? Camera 55. Notes overlay setup. GPS Camera 55. Add or edit collection/folder of image/points. GPS Camera 55. Beta version. GPS Camera 55. Coordinates lock. GPS Camera 55. Custom watermark. GPS Camera 55. PDF report and Email/Social export settings. GPS Camera 55. Pro pack upgrade information. GPS Camera 55. Units of measurement - General. GPS Camera 55. Version 1.1. GPS Camera 55. Version 1.2. What's new? GPS Camera 55. Version 1.2.1. Gps Camera 55. Version 1.3. GPS Camera 55. Version 1.4. GPS Camera 55. Version 1.6. Location accuracy is low, what can I do? Units of measurement - distance. Map Meter 55. Camera settings. Map Meter 55. Version 1.3, what's new? Planimeter 55. 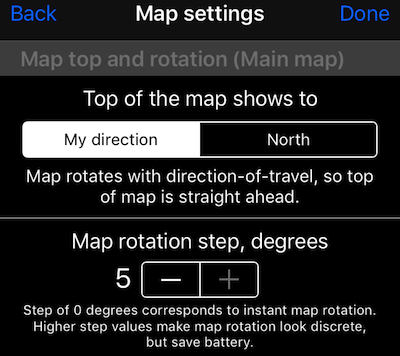 Apple map settings. Planimeter 55. Map list screen. Planimeter 55. Measurement annotations setup. Planimeter 55. Point collection/measurement screen. Planimeter 55. Units of measurement - General. Planimeter 55. Version 1.1. What's new? GPS indicator is red and taximeter doesn't update mileage. Help! Integration with Square Point Of Sale (POS) app. Min mileage idle time charge. Add to meter instantly. Min mileage idle time charge. Keep for later. Min mileage idle time charge. Take from min mileage. Min mileage idle time charge. Throw away. Sample setup of tariffs. Problem and solution. Setting up taximeter to work with miles (mph) or kilometers (km/h). Square Point Of Sale app integration settings. Taximeter version 1.3. What's new? Taximeter version 1.6 - what's new? Taximeter. Currency for receipt and logs. Taximeter. Version 1.4. What's new? Taximeter. Version 1.5. What's new? Taximeter. Working with sales tax. For other ways to access this screen, read here. 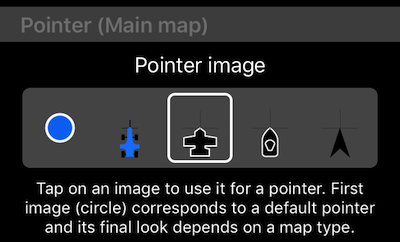 New to the common map settings is a "Pointer" section that allows you to pick from 5 pointer types for the main map. Optional "course line" on a main map. 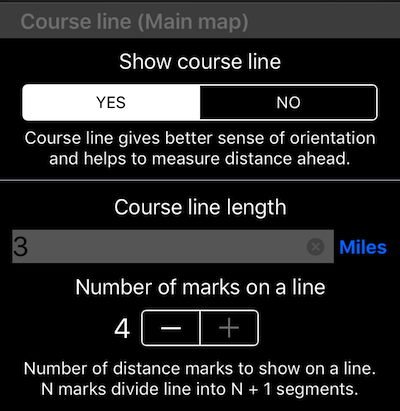 You can configure either to show the course line on a map or not and if YES, configure its length. Distance unit to the right of course length is a button allowing you to pick the required distance unit. Waypoints handling on a main or secondary maps. Note that app can switch waypoints grouping to be enabled if it thinks that performance would be bad otherwise. Option to pin a track to the main map. Pinned track will be shown on all maps (except the track viewer map) in cyan/host color so you can re-trace your track in forward or backward directions. #2 is a line to a waypoint or location set as a navigation target. You show/hide it by long press on a map and then selecting "show/hide" for the target line. You can also just cancel/stop navigation and line will go away. #3 is a course line. Can be shown/hidden via common map settings or again, via long press on a map and then show/hide. #4 is your "location tail", showing your recent path for better orientation. T1 is a waypoint. 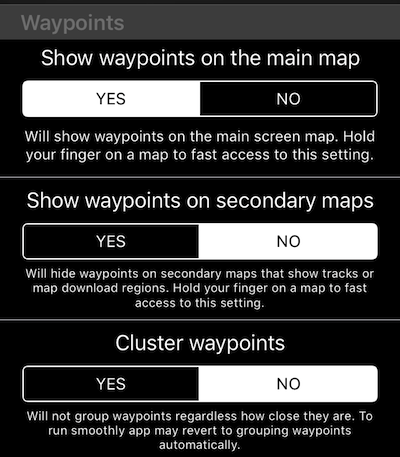 You can set waypoints being shown or hidden on the main or secondary maps in the common map settings or again by "long press" on a map to invoke the show/hide options. Create or edit an off road route on a map. Or import from GPX.